If you’ve made it to our blog, you likely already know that our website — and your go-to for metal building accessory needs — has undergone an upgrade. Metallic Products’ new online home is packed with even more valuable information than ever before. What’s changed? We’re glad you asked. While metal building professionals typically understand the ins and outs of the ventilation products we offer, the same isn’t always true for those who will be using the buildings. If you have clients looking to understand exactly what a roof hatch does, for instance, you can simply direct them to our product page to read on and learn more. 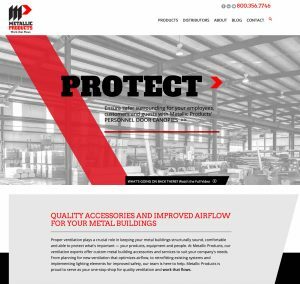 Every product page features more robust information about its respective metal building accessory than on our previous site. When you offer as many ventilation products as we do, those product listings can feel a bit unwieldy. Our goal is always to make life easier for those we serve, so we’ve created a site that’s a bit more intuitive. With just a few clicks of a button, you can access everything from in-depth blog posts to an interactive distributor list and, of course, our various products. It’s a little less digging — and a little more time to look for and learn about the metal building accessories you came here to view. This new website offers a whole range of tools aimed at making life easier for both the metal building professionals we work with and their customers, but we wanted to introduce some fun, too. Our online home’s overall look features big, bold images, plenty of breathing room and new video elements to take your user experience up a notch. Sure, those aesthetics might just make for a more enjoyable experience, but there’s nothing wrong with that! We hope you like the upgrade as much as we do! Please take time to look around and get a feel for the new and improved Metallic Products site.